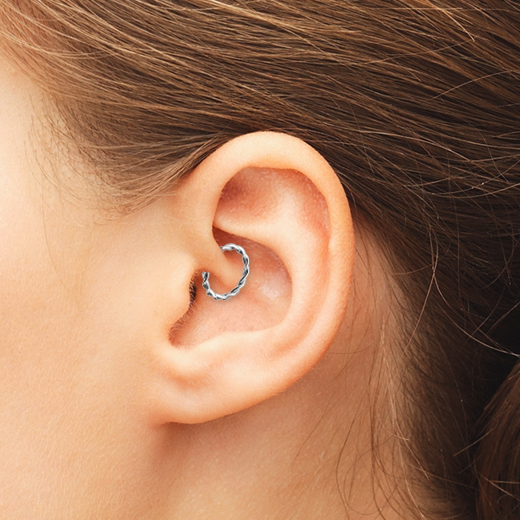 The daith earring seems to be the piercing everybody is talking about right now. This attractive look is made popular by both it’s awesome style, and its relation to curing migraines. Whether this is true or not is another question, and you can read up more on this below. Celebrities such as Kylie Jenner have made this look their own, and it is one of the most popular ear piercings out there, for one reason or another. It was made popular by world renowned piercing artist Eric Dakota. In this guide you can find everything you need to know about getting your Daith pierced, from what kind of pain to expect and cost to preparation. The first thing you will want to know about a Daith Piercing is exactly where it goes. The daith is the innermost piece of cartilage in the ear, passing along the crus of the helix. The area of the cartilage itself is in a curved, slightly awkward to reach the spot just above the ear canal. As the cartilage is a lot tougher than the earlobe, usually a hollowed 16 gauge needle is used to pierce the daith. Because of the rather sensitive location in the ear, the daith piercing is quite advanced and uses a special curved needle to get through the area. The purpose of the look is to ensure that the bottom part of the ring used for the piercing, looks like it is coming directly out of the ear canal. One of the main reasons the Daith Piercing has become such a popular cartilage earring is that many believe it is a cure for migraines, so here are 5 things you should know if that is the reason you want to get your daith pierced. 1. So far, there is no medical evidence to support the claim that Daith Piercings can cure migraines. 2. Many people believe that the daith is a pressure point, and the piercing acts as a kind of acupuncture therapy which can relieve migraine pain. 3. Experts at Cleveland Medical Clinic in the United States put the pain relief down to being part of the placebo effect, and not actually being real. 4. In most cases, however, customers have reported at least some improvement in migraine pain after getting a Daith Piercing. 5. Finally, just because it worked for some people, does not mean it will be a success with you, as this is unconfirmed medicine, so make sure you really want to be pierced. Make sure you want a Daith Piercing! The most important thing when you get any piercing, is that it is one you actually want. This is especially important when getting a Daith Piercing, as many people see it as a quick fix for migraines. This will not be the case, even if it does help in some way. You have to make sure that you also will actually want the piercing, not just its side-effects. However, it is an awesome looking piercing, and if you do want it, then it’s a great piercing to have. Daith piercings are going to be a little bit more expensive than regular cartilage piercings. Due to the advanced nature of the procedure and the higher levels of skill required, piercing artists will charge a little more. Of course, the price can vary depending on the demand of the piercing, the location of the store, and the skill of the artist. You should never go for the cheapest option though, especially with Daith Piercings, as it requires very high levels of skill to perform. The Daith piercing really depends on the person, as it can take anywhere between 4 and 12 months to completely heal. With proper piercing aftercare, and if you don’t fidget or play with your piercing, a 6 month healing time is more realistic. Don’t take out your piercing before it is healed, so make sure you choose a daith ring or labret stud piercing which you really like before getting pierced. Make sure to get solid titanium ones though! How much will a Daith Piercing hurt? Pain is always subjective to the individuals' experience, but the Daith is going to be a bit more uncomfortable than regular cartilage piercings. Because of the awkward position, it holds on the ear, the daith must be pierced very delicately and slowly, in order for the piercer to not get anything wrong. This means that you will most likely feel it for a little bit longer than other piercings which are over in a flash. The Daith Piercing will take a few more seconds to complete. As for the post-procedure pain, the daith will remain dull and sensitive for a couple of weeks, but proper aftercare will take care of much of this. Here are a few handy tips to help prepare you for getting your Daith piercing. - You might want to have a drink before your piercing to work up the courage; DO NOT DO THIS. Most piercing artists won’t even perform a procedure if you have consumed alcohol. - Stay away from caffeine before your piercing, because this will increase your metabolism which may speed up the bleeding. - Eat something light and small before getting pierced, don’t go in starving. - If you have long hair, tie it up to make life easier for your piercer. - Make sure the Daith piercing is what you want, and are not just looking for a quick migraine fix. Like all piercings, there are of course risks involved when getting your Daith pierced. - Make sure you’re using a professional piercer, as using unsanitary needles can cause very serious infections. - Even with the best conditions for getting a piercing, you may still get a minor infection, or the piercing may be rejected by your body. If your piercing remains sore and red after 3 weeks, it may be infected, and you should consult a GP. - Cauliflower ear can occur due to blunt trauma to the ear. Though this deformity is more often associated with boxers and rugby players, this can also occur in the healing process of a Daith piercing, as it shrivels up when healing and folds in on itself. This is extremely rare and if noticed early can be treated. To avoid nasty infections or complications after getting your ear pierced, you should follow our steps for taking proper care of your Daith piercing. 1. ALWAYS make sure your hands have been properly washed with soap before cleaning your piercing. 2. Salt and water solutions are the best product for cleaning, so try one of our salt spray solution for the best results. 3. Use thicker kitchen paper or a non-alcoholic swabstick to clean your ear, cotton wool is not suitable. 4. Carefully move your piercing around a little bit to let the solution soak all the way through. 5. Two cleans a day is plenty, any more than this will just irritate the pierced area. 6. Avoid any chemical based solutions such as alcoholic or hydrogen peroxide, as they will just cause more issues. 7. Unless specifically told by your GP, try to avoid any thicker oils and creams in the first 2 weeks, as they could just block up the piercing area, slowing the healing process.